This paper describes a recent specific example of how Nuclear Electric has demonstrated the capability of a remote automated ultrasonic inspection on its Advanced Gas Cooled Reactor plant. Following the discovery of a small leak in a 300mm diameter austenitic steam tube there was an urgent requirement to develop a capability for inspecting all similar welds and to provide a demonstration of capability of the inspection. The first part of the paper describes the inspection requirements, the ultrasonic techniques used and the procedure and equipment which was developed. The second part describes how the capability was demonstrated: all the evidence to support the capability was embodied in a technical justification which was prepared under contract by the AEA Technology Inspection Validation Centre (IVC). The technical justification included a combination of theoretical evidence and practical evidence from open and blind test block trials together with experience of inspection of other similar components. Within a period of less than two months from initial request, an inspection capability had been developed and justified and was then successfully deployed on-site. joining an austenitic steam tube to an austenitic forging (see Fig. 1). This led to a joint Nuclear Electric - Scottish Nuclear programme to inspect the remaining twenty three Shop Weld 1s at Hunterston and also all twenty four Shop Weld 1s at Hinkley Point B, a sister station to Hunterston and operated by Nuclear Electric. Each of the two stations comprises two identical reactors generating approximately 660MW each. Following the steam leak, and on completion of interim remedial work, a safety case was made to return to service the affected Hunterston reactor, to continue operation of the remaining three reactors, and to inspect all Shop Weld 1s at the earliest opportunity. Therefore all inspection development and validation had to be completed in time for the Hunterston and Hinkley Point statutory outages that were planned for June 1996. Because of the very short timescales for the inspection development several of the major activities had to run in parallel (see Fig. 2). The only feasible access for ultrasonic inspection of Shop Weld 1 was to deploy probes 7m down the bore of the steam tube (see Fig. 3) and therefore a substantial part of the development programme was the design, fabrication, and commissioning of a suitable manipulator. a measured through-wall size of greater than 3mm and circumferential length greater than 15mm in the parent material inspection volume. a measured through-wall size of greater than 4mm and circumferential length greater than l5mm in the weld volume. Ultrasonic data was collected by a RR & A (Rolls-Royce and Associates) Micropulse 2 digital flaw detector and processed using MIPS (Micropulse Inspection Processing Software). The processed data was then displayed and analyzed using PC GUIDE (Graphical Ultrasonic Image Data Evaluation). Both MIPS and GUIDE have been developed by Nuclear Electric and this system has been the standard for several years for all of Nuclear Electric's automated ultrasonic inspections such as Sizewell B PWR pre-service and in-service inspection (Fig. 4 shows how the system is configured). The capability of the hardware and processing software is well understood and robust. A large pool of NDT personnel, who have been formally qualified to use MIPS and GUIDE, is available. This is discussed further under 'Inspection Personnel'. A drive tube, consisting of connecting segments, which provided the link between the drive frame and the inspection head. 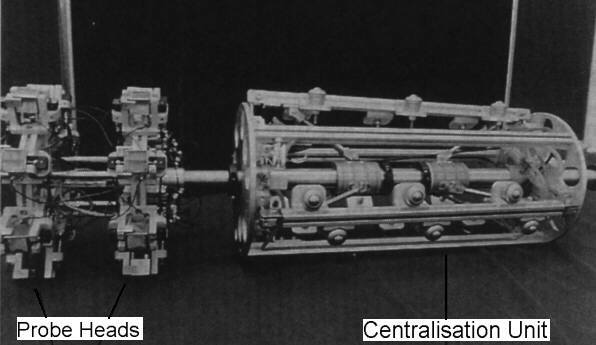 The drive tube was positioned in the centre of the penetration by several pneumatic centralising units. The main centralising unit, located close to the inspection head, held a miniature TV camera used for axial alignment and visual monitoring of the probes. A drive framewhich was bolted to the outboard flange of the penetration and provided both the axial and circumferential motion through the drive tube to the inspection head (see Fig. 6). The development programme did not allow any time for significant technique development prior to ordering the manipulator and probes. The approach adopted was to specify the techniques using our experience of the ultrasonic inspection of other austenitic welds and our understanding of the physical principles of austenitic inspection. The capability of the techniques selected was then verified by experimental work carried out in parallel with equipment procurement. The probe/scans used for the inspection are shown in Table 1. Each probe was provided with couplant feed tubes and was contoured to match the inside surface of the penetration. 3mm diameter side-drilled hole +42dB for the 45° and 60° compression wave scans. 3mm diameter side-drilled hole +36dB for the 70° compression and 60° shear wave scans. It was judged that this scanning sensitivity was sufficient to provide a reliable detection capability for the defects described above with a low probability of false calls. The skills and experience required for data analysis using GUIDE, particularly for austenitic inspections, are generally higher than those required for data collection using MIPS (although many operators are qualified for both). Data collection can proceed whilst the data analysis is being performed thereby reducing the overall inspection time. The data analysis and subsequent reporting can be performed in a clean environment. The basic methodology for data analysis is to combine the information from all of the beams to characterise any suspect regions. This characterization process requires an understanding of how the ultrasound from each probe interacts with a potential defect and with features of the component to identify the origin of an indication and also to measure its dimensions. Any indications that cannot be attributed to a spurious feature (such as a weld fusion face echo) and which exceed the reporting criteria are then reported. 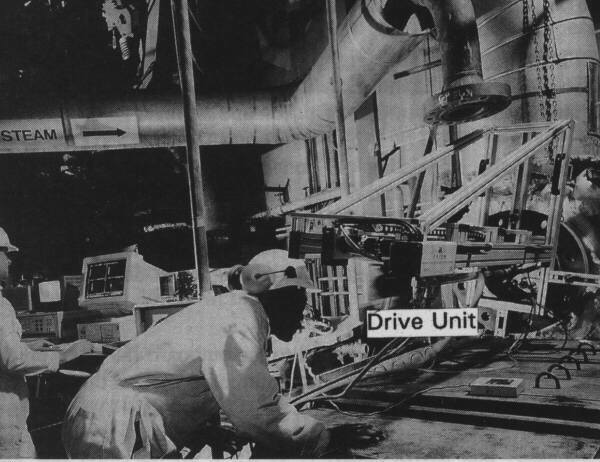 Two test samples containing artificial defects were designed and ordered at approximately the same time as the order was placed for the probes. Vertical defects were simulated by spark eroded slots and coupon lack of sidewall fusion represented defects aligned with the weld fusion face. In practice any reheat cracking aligned with the fusion face would be displaced from the fusion face by several mm, but having the defects located on the fusion face represents the worst case situation. One of the specimens also contained spark eroded slots in the weld volume to simulate weld cracking. Each of the defects had a through-wall extent ranging from 3mm to 6mm, one of the defects had a circumferential length of 60mm with the remaining being 30mm long. Although the lengths were longer than the reporting length, it is the through-wall extent that is the crucial parameter for detection and sizing. The specimens were representative in terms of geometry and materials and were designed to be mounted onto a full-scale fibreglass mock-up representing the full length of the steam tube. There was a safety case requirement to produce evidence that the inspection would achieve the detection and sizing requirements given earlier in this paper. This demonstration of capability was achieved using the principles of the ENIQ methodology by combining evidence from both theoretical considerations and from practical trials. Using the ENIQ methodology the theoretical and pre-existing experimental aspects would have been presented in a Technical Justification and this, together with results of practical trials would have formed the Qualification Dossier. In line with previous applications we chose to extend the scope of the Technical Justification to include all the evidence to support the capability of the inspection so a Qualification Dossier is not required (the Technical Justification was then the 'Summary of Technical Evidence' in current ENIQ terminology). The Technical Justification was prepared by AEA Technology's IVC (Inspection Validation Centre) under contract to NEL. Because of the demanding programme timescales, the Technical Justification was prepared in parallel with the inspection development. NEL and the IVC agreed a framework for the Technical Justification to which was added information from the development programme as it became available. The final issue of the Technical Justification was not required until after the site inspections commenced although an advanced draft was provided prior to this to ensure that all of the necessary information was available. Manipulator performance. Rigorous acceptance tests were performed on a full scale mock-up to demonstrate the capability of the manipulator and, in particular the positional accuracy. A theoretical discussion of the detection and sizing capability. The results from other similar inspections to help justify the claimed detection and sizing capability. Blind trials on test pieces containing artificial defects, and representing the component geometry. These test samples were inserted into the full-scale mock-ups thereby assessing the capability of the complete system. Once the Technical Justification had been issued (after internal review by the IVC) it was used as a supporting reference to the safety cases for the reactors and as such was subjected to formal independent assessment by Nuclear Electric's HSED (Health, Safety, and Environment Division), prior to submission to the Licensing Authority. Thus, in some respects, HSED effectively acted as the Qualification Body in ENIQ terminology. The inspections at Hinkley B and Hunterston were manned using a combination of Nuclear Electric staff and contract staff. Each of the data collection teams comprised two NDT operators qualified in the use of MIPS; at least one member of each team had had previous experience in similar MIPS applications. Each of the MIPS operators received training in the specific use of the manipulator and some operators gained experience through assisting in the development programme and manipulator commissioning. The data analysts were all qualified in the interpretation of ultrasonic data using the GUIDE software. All of the data analysis was verified by a different operator. In view of the stringent qualification requirements and verification of data analysis it was not considered necessary for individual operators to be qualified specific to this inspection. However, typical operators were used during the blind trials to further demonstrate the adequacy of the required training/certification. All of the equipment performed well during the site inspection and the results from the manipulator commissioning trials that were used in the Technical Justification were upheld. The planned inspections of all twenty four penetrations at Hinkley B and twenty three penetrations at Hunterston were performed within the planned time with one defect being reported at Hinkley B. The defective penetration was removed and replaced and subsequent destructive examination confirmed that the statements made in the Technical Justification regarding the detection and sizing capability were correct. using staff with extensive experience in automated and austenitic inspections. This enabled the capability of the inspection to be predicted in advance with good confidence and early placement of the probe orders was therefore possible. demonstrating the capability of various parts of the inspection e.g. manipulator at the earliest opportunity. maintaining a close contact between those developing the inspection and the authors of the Technical Justification. This ensured that there were no 'surprises' once the Technical Justification had been issued. The authors would like to acknowledge the contribution of all those staff at Nuclear Electric Ltd., Scottish Nuclear Ltd, and Scottish Power whose combined effort led to the successful completion of the inspections. For more information see backup issue: NDTnet 12/97: NDT in Power Generation.